There are two things that you have to do when you visit San Diego: walk along the marina and go to the Zoo. And when you get to the Zoo you have to have lunch at the Prado and see the pandas. The bonus for us was that the five month old cub was outside and becoming bolder every day. We got to the Zoo before it opened and went straight to the panda exhibit and there was the cub - stuck up a tree like a black and white wombat. I refused to leave until it came down and after ten minutes or so the mother panda became uneasy and started to call the cub down. The cub tried to climb down but it was a fir tree and the branches went out and the only way down was to climb to the end of a branch and drop off. The fall was about four feet but the little cub let go, hit the ground, dusted himself down and walked it off. 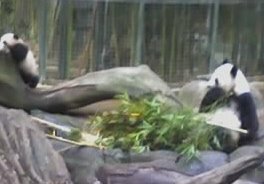 His mama cuddled him, then went back to stripping bamboo. This is the cub exploring again. We left then, but according to people we met later the cub went into his pen and didn't appear for the rest of the day.